Even with only three months to prepare, I was determined to do my best. I expected to work hard. But I was completely unprepared for how much I would learn in the process—and for how exciting this challenge turned out to be! While all this is fresh in my mind, I'd like to share it with you—because it applies to any important presentation. I sure wish someone had made this information available to me! My mistakes and how I discovered them. The four things to be sure to have with you. Now that the talk is over (and available on YouTube), I've decided to share what I discovered—the information I wish I had known before I started this process—including the essential information you need, in order to avoid the ugly surprises that I was unprepared for. As you can see, this is a lot to keep track of. But I will break it all down for you, including handouts and worksheets you can download and refer to later. This "course" consists of two 90-minute webinar sessions, a week or so apart, in early- to mid-March. I will give the sessions via a video/audio/graphics service that lets you easily join the calls. You will be able to hear me, see me, and see whatever documents I share during the call. You will be able to join via telephone or via computer (whether or not you have a video camera or separate microphone). Not only will you take part in the live sessions, you'll have chances to ask questions about each of the topics. If someone had offered me this course back in September, I would have gladly paid several times the tuition I'm asking of you! When will the course meet? Answer: two online "lessons" (that you can access via audio and/or video) in March, 2018. There will be three sections. Tuesday evenings, March 13 and 27. 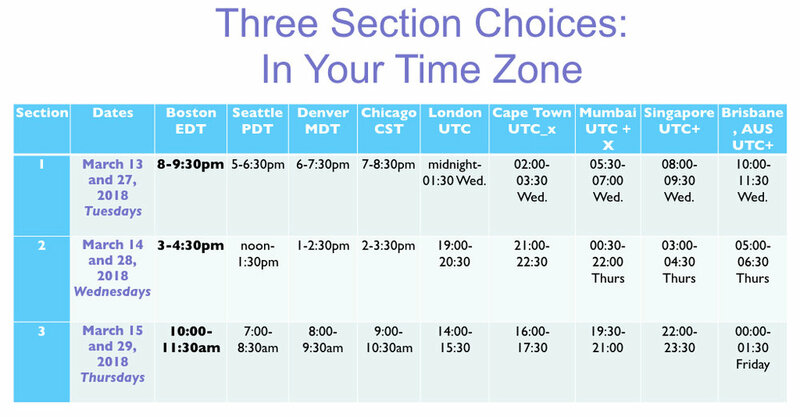 For the equivalent in other time zones, please see the chart near the bottom of this page. Wednesday afternoons, March 14 and 28. Thursday morning, March 15 and 29. Choose your desired section from the list near the bottom of this page. Yes, you can switch sections after the first call. Don't forget: the lessons will be videoed and available on the course website for you to view at your leisure. No need to worry if you have to miss one! Like all my courses and products, this course is completely guaranteed. If you're not satisfied for any reason, let me know. I'll give you a refund. No hassles!